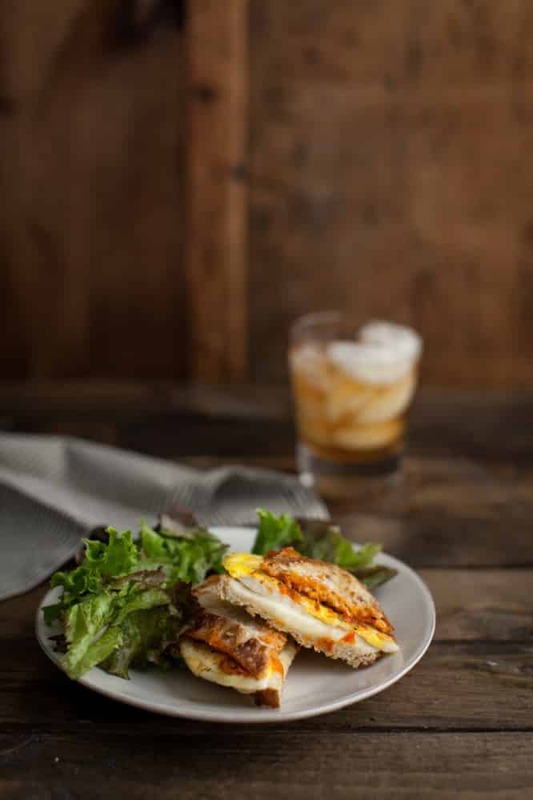 Harissa + Egg Grilled Cheese Sandwich | Naturally. There was a time in my life that I thought for sure I was destined to be a baker. I loved baking because it was science, it was exact. I went about learning the formulas and creating recipes for my bakery that I thought I would one day open (and it *almost* happened but I’m really glad it didn’t.) Then, about the time I started with the CSA, I realized how freeing cooking could be. Instead of exact measurements it became about the senses. It became about using whatever I had on hand and adding a dash here/sprinkle here. I think now instead of a bakery, you’re probably more likely to see me in a food truck traveling across the country, serving “vegetarian around the world” with tacos, curry, spring rolls, and sloppy joes. Why this elaborate intro to a grilled cheese? Because this is pretty emblematic about why I love cooking. The first version of this sandwich manifested itself nearly two years ago as a roasted tomato and egg cheese sandwich. I then learned the joy of a quick, mild harissa that permeated a few recipes, including and avocado grilled cheese sandwich, which led me here, to combining the two. I love grilled cheese and eggs together. I prefer the fried egg while M, after coming back from a conference in New York, professed a strong liking of poached eggs on sandwiches. Use either this version or the roasted tomato version- both are some great sandwiches! In a blender or food processor, pulse garlic until minced. Add remaining ingredients and pulse until harissa is well combined. Taste and adjust seasoning as desired. Preheat grill pan or regular pan over medium-low heat. Brush outsides of bread with olive oil. 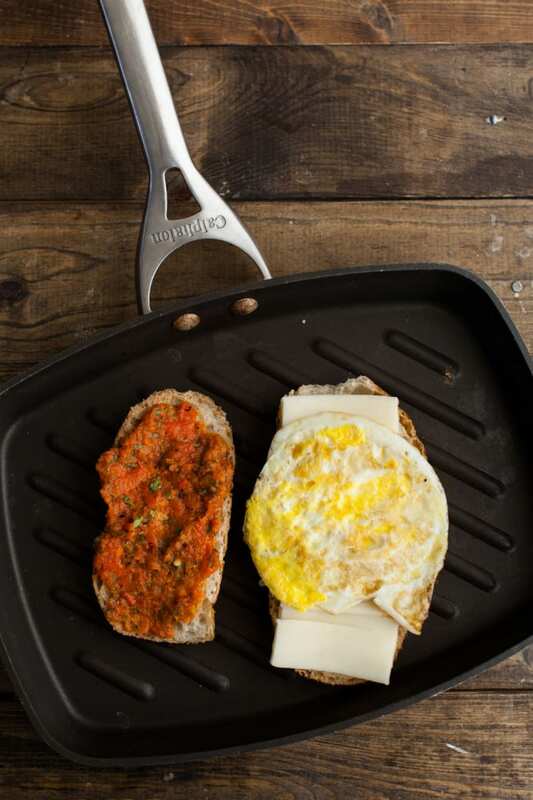 Place on piece of bread, olive oil side down, in the grill pan and smear on 2 tablespoons of harissa. Layer with fried or poached egg and 1/2 the cheese. Smear 1-2 more tablespoon of harissa on remaining piece of bread and place olive oil side up. 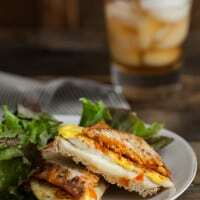 I love this idea of the egg on a grilled cheese sandwich, you’re a genius Erin! I love that you say cooking is about sensing. I prefer it over baking for the same reason, plus the fact that cooking helps us not only be in tune with our senses but *listen* to what they’re saying too. 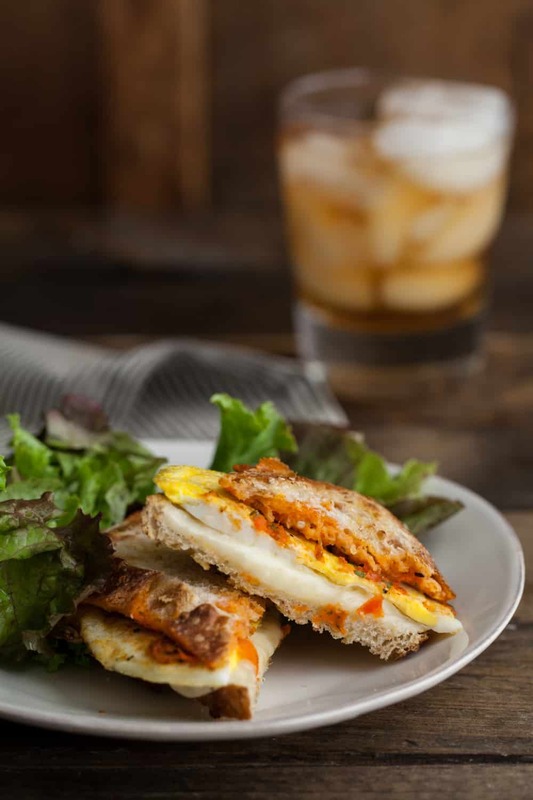 Love everything you do with harissa, and this sandwich is no exception! 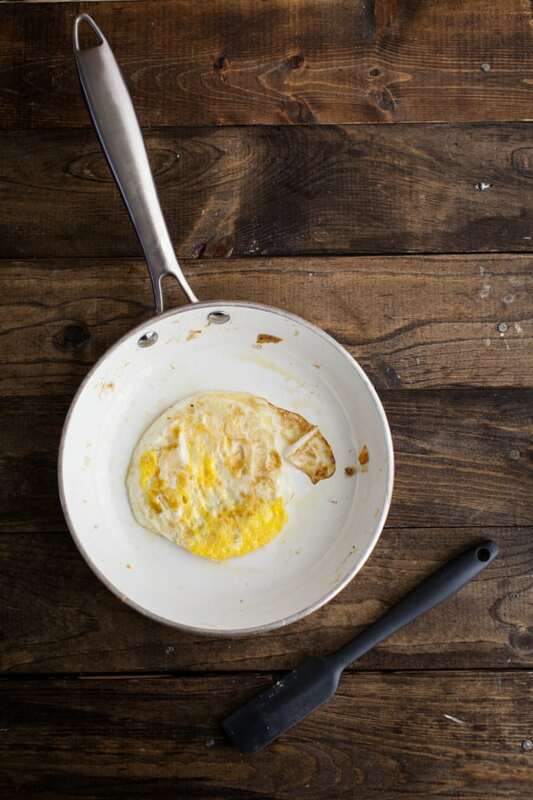 Love the sound of harissa and egg – so smoky and delicious! OF COURSE you made your own harissa for these!! Pretty sure I’m never going to be able to buy a street cart egg sandwich again as they’ll pale in comparison.